A place in the Premier League is the prize for the winner of Monday’s Championship Play-off Final between Reading and Huddersfield Town, a £200 million game! Who will win at Wembley? 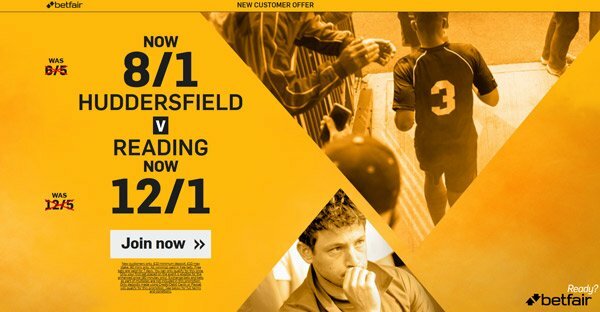 This article contains our Huddersfield v Reading betting preview with predictions, betting tips, probable lineups, team news, enhanced odds, live streaming links, bookmakers offer and no deposit free bets on the clash! Huddersfield Town, who led the Championship for much of the regular season, ended up finishing fifth and qualified for the Play Off Final by beating Sheffield Wednesday on penalties. They have won just one of their last seven matches in ninety minutes. Their tally of 56 goals from 46 games was only thirteenth best in the Championship and with 58 conceded they finished with a negative goal difference. Both Championship direct meetings ended in 1-0 home wins. Manager David Wagner is expected to stick with his settled back four of Tommy Smith, Chris Lowe, Michael Hefele and Christopher Schindler. Forward Elias Kachunga is likely to be fit despite coming off in the second leg of the play-off semi-final against Sheff Wed. Izzy Brown and Nahki Wells are both set to start up front. The likes of Pilip Billing and Jon Gorenc Stankovic remain out through injury. Reading have lost just one of their last seven fixtures and finished third in the regular season missing the automatic two promotion spots by a 8 points. They overcame London club Fulham 2-1 on aggregate in the play-off semi-final, drawing the first leg 1-1 away from home and winning the return 1-0 in front of their own supporters. The Royals have scored at least once in their last 11 matches. Captain Paul McShane remains banned with Tiago Ilori expected to replace him, and left-back Jordan Obita is a major doubt for Monday's match. Yann Kermorgant will start upfront, while Garath McCleary could start in midfield. Winger Callum Harriott has been ruled out for an indefinite period with a hamstring injury that requires surgery and Sandro Wieser, Stephen Quinn and striker Deniss Rakels are also sidelined. "Huddersfield v Reading betting tips, predictions, lineups and free bets (Championship Play-Off Final - 29.5.2017)"